Is Chris Koster a Democrat or is he Clueless? At any rate, while I would like to see our state officials join the Obamacare lawsuits, I worry that Koster will just flip to the other side after he joins. This is not the sort of person either party should want in government. No one will support Koster if he flips. The public is not kind to party flip-floppers, as is evidenced by Arlen Specter and Joe Lieberman. Koster needs to talk to the people who elected him and think seriously about performing his job rather than wasting precious state money on political theatre. You can reach his office at 573-751-3321 or attorney.general@ago.mo.gov to let him know what you think. Yesterday, I wrote about the pathetic attempt of right-wing hacks to attack me based on a fake Twitter account. However, that attack was actually the culmination of a series of disingenuous attacks by a group of Breitbart bloggers this weekend that revealed the moral depravity of the group. 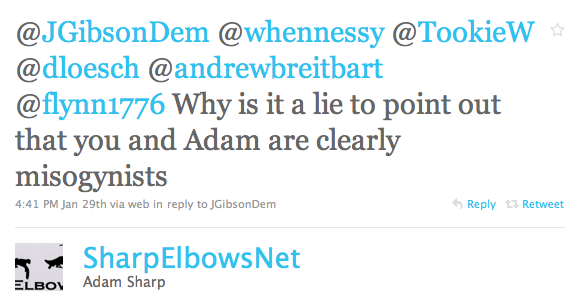 As noted yesterday, my post on John Burns' nonsense must have struck a nerve. 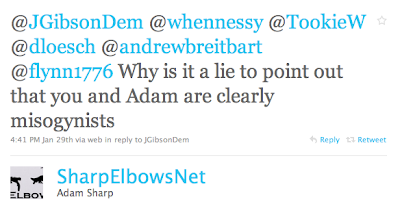 In fact, as if accusing me of "hating women" isn't bad enough, when 25thCenturyGirl jumped into the discussion, Gerdes claimed that I "attack children:"
Having one Breitbart lackey attacking me with blatant lies wasn't really news, but what made it strange was that a large group of Breitbart minions quickly jumped in, and they apparently were familiar with things like where I work. Here's "Liberty Chick:"
For the record, we didn't play dodgeball; we played kickball. And I was picked first, thankyouverymuch! This whole episode demonstrates just how incredibly pathetic the average right-wing blog reader has become. The fact that this group of people, including 3 editors of the Big websites, can get away with mean-spirited personal attacks based on absolutely no evidence whatsoever is a testament to the fact that their audience simply doesn't care about evidence. They can scream out vicious attacks without a shred of supporting evidence because the readers of the Big sites are indifferent to standards of good journalism or human decency. However, that just makes it that much more important that mainstream media outlets and honest conservatives call out the hatred and shoddy attacks from this group, rather than giving them a further platform for this corrosive nonsense. They are not going to police themselves because they have no incentive to do so: but members of society who actually care about truth and decency have a duty to stand against these slime attacks. Fortunately, I know how to handle their garbage, but when they pick on people who aren't used to it, as they often do, they can do some real damage. It's up to the rest of us to make sure that this doesn't happen. One year and one day ago, tireless activist Melanie Shouse passed away after a long and courageous battle with breast cancer. Her dedication to making the world better was an inspiration for activists in St. Louis and across the country. Last year I collected some of the stories that were written in her honor, which can be found here and here. Thanks to Brian Matthews and Bunnie Gronborg for their touching tributes on facebook. After a month long hiatus, this week Adam and I talk with Sean at FiredUp! Missouri about the priorities of the Republican State Legislature, Rex Sinquefield, and the general political landscape in Missouri. Join us to find out what progressives should watch out for in 2011. 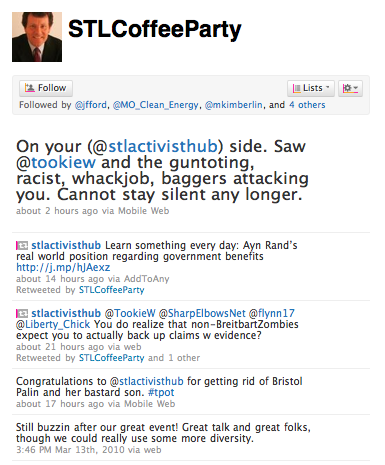 Mysteriously, though, the comment by "stlcoffeeparty" was immediately retweeted by @TookieW, also known as Chip Gerdes, a Republican operative from Quincy, IL who had been spending the whole day claiming that I "hated women" because I point out hypocrisy and inconsistencies from Dana Loesch, as well as those from Jim Hoft, John Burns, Bill Hennessy, etc. Obviously, whoever wrote the tweet from the "coffee party" account is despicable, no matter what their politics. However, equally obvious, from my perspective, is that any organized right-wing efforts to use this fake account to attack me would be a pretty compelling demonstration of stupidity and evil. The tea party narrative of victimization is reaching new, unprecedented heights. If you recall, John Burns of American Majority and the St. Louis Tea Party tried to disrupt the free speech of LGBT activists, was involved in James O'Keefe's plot to sexually humiliate a CNN reporter on secret camera, and led a campaign against public transportation based on incessant lies that ended with a ridiculous publicity stunt where they claimed that the Mayor of Chesterfield was "harassing" them. Burns also has a bizarre obsession with Washington University. He, along with James O'Keefe and Joseph Basel, secretly videotaped Washington University employees and then selectively edited the tapes to try (and fail) to convince people that the campus has an agenda against conservatives. He then accused the university of "malicious, retaliatory action" when the university asked his group to pay for the cleanup of hammer and sickle graffiti they sprayed around the campus as part of their gulag display. In paranoid rantings, he claimed that college administrators have "Stockholm syndrome" and that conservatives on campus have to be prepared for the university to come after them with "guns and night sticks and handcuffs..authorized to do violence against you." Considering his obsession with the belief that conservative free speech is somehow being oppressed it's also quite ironic that he has stated that one of the goals of the tea party is to purge all liberals from academia. So the message is, “Don’t bother coming, Bristol, or we’ll shout you down and riot because WE DON’T WANT YOU HERE!” This seems eerily similar to Southern intimidation and oppression of blacks during attempts to desegregate. It’s reminiscent of a scene from Forrest Gump, where a young black girl is harassed by a young white student and knocks her books out of her hands. Let’s not kid ourselves, here. what has transpired at Wash U is nothing short of bigotry and hate. These students weren’t protesting Bristol because she’s some evil mass murderer. No, they’re protesting her because they hate her. Yes. Hate. They hate everything Bristol represents, and they hate the fact that proponents of abstinence and others that share Bristol’s family-oriented culture suddenly have a beautiful, popular advocate – who can dance! They hate the fact that she makes being a goody goody look attractive and desirable. It's pretty amazing how idiotic Burns' assessment is, though it is entirely in keeping with his paranoid hatred of academia. The issue with Bristol was, from the beginning, the belief on the part of the students that (1) there was nothing to indicate that she was qualified to speak on the subject of abstinence to a college audience and (2) she certainly wasn't worth the $15,000+ that she was going to be paid. I can say unequivocally that students, and particularly liberal students, disliked Karl Rove and Alberto Gonzales far more than they disliked Bristol Palin. In fact, I doubt most students actually dislike her. But there's a reason that Bristol was disinvited and Rove and Gonzales weren't: and that is that it's obvious to any clear-thinking person that she's not qualified to speak to a college audience about this issue. In fact, I've heard from multiple students that the College Republicans were opposed to paying Bristol Palin that much money to speak. On Tuesday evening, Treasury voted to approve SHAC’s $20,000 appeal to bring in Palin and the three other members of the panel. According to SU VP of Finance Eliot Walker, SHAC will now have to return the $20,000 and resubmit an appeal to fund the new panel. If the group’s new appeal is less than $1000, as Walker said is expected, SHAC can take its request straight to Walker for approval, as opposed to going through another round of a Treasury vote. So yeah. Only $19,000 from Bristol as opposed to $20,000, while the other three speakers cost a maximum of $1,000 combined. Great argument there. The tea party might be finding ways to propel their absurdist rhetoric to new heights, but it's comforting to see that their lack of commitment to facts remains the same. Anyway, I thought the report of the opposition of the St Louis Tea Party Association was rather odd so I checked it out. I found out that it was true that the Board of Directors of the St Louis Tea Party oppose the local control issue. But no “vote” of the members/supporters was taken. 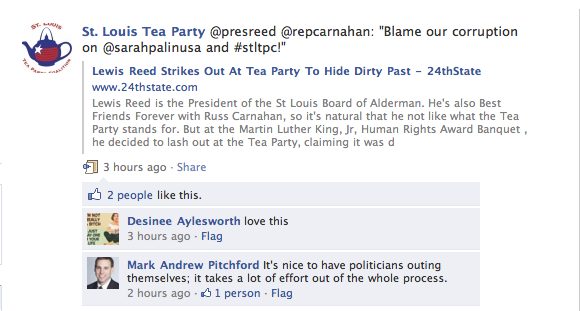 In other words, the tea party claims to be a huge group of people across the St. Louis region. Then, a small, unelected Board of Directors makes decisions and even goes to Jefferson City to announce their position on controversial issues without even consulting the membership! So you have, what, 5 or 10 people claiming to speak on behalf of 5,000, without even actually consulting any of the people. In fact, they didn't even bother to announce on any of their blogs that they were planning on going to Jefferson City to "state the Tea Party position" on local control. No doubt those same self-appointed leaders use political positions like local control to curry favor with political players and to enhance themselves. They are, and always have been, about enhancing themselves rather than fighting for conservative ideals. Both Kansas City and St. Louis would like to gain control of their police departments from the state. I am friends with some St. Louis city cops, and I have never talked to one who liked this possibility. Control by the state board means that the police department answers to one board and the governor, not to 28 aldermen and 11 citywide elected officials. 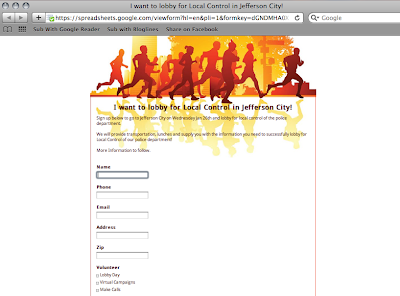 However, in Kansas City, with its city manager form of government, local control might work better. I wonder: is there any evidence of Rex Sinquefield supporting local control prior to 2010? ...it might be time to hit the shower. Yesterday, I noticed quite a few people upset online about the obvious right-wing bias of a KSDK panel put together to analyze Obama's State of the Union address. The panel consisted of center-left Missouri Democratic Chair Susan Montee, Obama supporter Kevin O'Malley, straight right-wing GOP operative Ann Wagner, and far right extremist Bill Hennessy of the tea party, along with straight political analyst Dave Robertson. I think it's pretty obvious that two moderate or center-left viewpoints are not really "balanced" with one hard right and one extreme right spokesperson: the scale is tipped to the right. And, at the very least, it is unquestionable that nobody more liberal than the mainstream Democratic party was represented, whereas Hennessy represented a perspective further right than the mainstream GOP. This of course is a regular pattern in the mainstream media, where far-right positions untethered to reality are regularly given air time alongside Republicans and Democrats, but liberal positions are treated as not even worthy of discussion. I know from the messages I got that quite a few people called KSDK to complain about the lack of representation from a more liberal perspective. And how did KSDK respond? By keeping all of the same people and simply declaring at the beginning of their program that "every part of the political spectrum was covered." I'm not sure if this was intended to be a slap in the face of the people who had asked them to balance their program, or if they really just think their viewers are stupid enough to automatically accept everything they say without thinking about it. In history, most of the problem that has arisen for the people, didn't come from other people, it came from a tyrannical government, or from a government of another country invading. Because everyone knows that governments aren't made up of people. They're made of Nazi juice and Stalin mustaches, or something. Unfortunately, it sure looks that way. We all knew that quite a few St. Louis City Democrats were supportive of millionaire right-wing ideologue Rex Sinquefield's plans to move money from public schools to charter schools. The folks who run the City Democrats Many prominent Democratic politicians also recently decided (or were persuaded) not to resist Sinquefield's state-wide proposition to eliminate the earnings tax in Missouri, leaving it to grass roots groups to organize on minimal money to educate voters and solidly beat Rex in St. Louis City (which is important because, despite what some local Democrats are saying, voters are not so stupid as to magically forget what the earnings tax is before the April elections). But now it appears that local Democrats' collaboration with Sinquefield is taking a new, potentially devastating turn. Activists in the City of St. Louis have been organizing for local control of their police force for a long time. And for a long time, they've been ignored by politicians in Jefferson City, who see no reason to concede power to the City of St. Louis for mere ethical reasons. However, in recent months, there's been a huge amount of momentum for local control. As I wrote earlier, I'm in favor of local control. However, alarm bells went off for me when I saw that Sinquefield and his employee, former Americans for Prosperity director of Missouri Carl Bearden, were getting involved. As reported today by FiredUp and Show Me Progress, Sinquefield created a new PAC, A Safer Missouri, and promptly donated $300,000 to the PAC. That's all well and good, assuming that everyone is up front about who exactly they're working for and where contact information is going. Unfortunately, however, this appears to be precisely what is not happening. Mayor Francis Slay, his employee Mary Ellen Ponder, President of the St. Louis Young Dems Martin Casas, President of the Board of Aldermen Lewis Reed, and Jamilah Nasheed all tweeted out a link to this google form. Well, to be specific, Nasheed and Reed tweeted a link to an article on Reed's St. Louis Core website, which included a request for the RSVP that linked to the same document. As I think is obvious to anyone who knows google forms, what this does is it collects your contact information and puts it into a google spreadsheet. This contact info, of course, is useful for future political campaigns. Groups interested in transparency will generally tell you how your information is going to be used. Unfortunately, this document has no disclosures of that sort. Via Twitter, I asked most of the group if they could assure me that the information would not be used for any of Rex Sinquefield's campaigns. None of them replied, except Casas, who said he "had no idea," despite the fact that, as was made clear in the Mayor's tweet, Casas is the point person for the day. Slay and Reed continued tweeting, and didn't answer my question. Of course, It would be vaguely interesting if all that happened was that the elected officials and operatives who were promoting this form only ignored my question and refused to simply say, "the information collected via that form will not be used for any future Rex Sinquefield campaigns." But it's actually worse than that. Because it's not just that they did not answer my question. It appears that I found the answer on my own. On Wednesday, January 26th the Missouri Senate will hold a hearing on Senator Keaveny’s bill that restores control of the St. Louis Police Department to the City of St. Louis. The hearing is scheduled for 2:00pm at the Capitol. Dozens of St. Louis residents will join Mayor Francis Slay and President of the Board of Aldermen Lewis Reed that day in Jefferson City and visit with legislators about Local Control. Can you participate? We will offer transportation to those who need it. In other words, Democrats in the city of St. Louis are apparently actively working to build the email lists of Rex Sinquefield, even as Rex is trying to push through a mega sales tax bill that would eliminate income tax in the state and shift the burden entirely to sales tax. This bill would gut our already struggling state government and would shift the tax burden to the poor and working class and away from the wealthy. Furthermore, one wonders if city officials are also agreeing to keep quiet about the mega sales tax in exchange for Rex's support. Will they sit out a fight on a bill that would damage state government and hurt the people who can least afford it, just like they did with Rex's earnings tax repeal in November? One other thing I'd like to point out: this is not really about a question of "how liberal are you?" Reasonable people can disagree about issues, if they debate them honestly. This is an issue of transparency. If a deal has been made with Rex, we deserve to know. If email lists and contact information are going to Rex, we deserve to know. 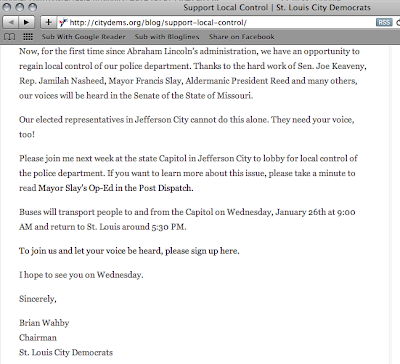 That is about nothing more than the City Dems being honest and upfront about their dealings. We deserve that much, as do organizations like the DNC who are trying to decide if St. Louis is the best place for a national convention. Of course, it's not too late. Any of those officials and operatives can now clear up this situation by declaring (1) that none of the emails collected from the Google Document will be used for a future Sinquefield campaign and (2) that they will vocally stand strong against Sinquefield's disastrous mega sales tax proposal and other attempts to destroy the government. I await their response, and I think it's fairly obvious how to interpret silence. Update: A friend pointed out that the City Dems, as in the official group known as "The City Dems," did activiely oppose Proposition A in November. Apologies to that group and Brian Wahby for incorrectly characterizing their previous involvement. However, prominent politicians, most notably Slay and his crew, did not. I've changed the title and text to reflect that fact. It also doesn't explain why the City Dems would now be helping to promote Sinquefield's organization and building his email list. What's the Cost of Local Control? Like most St. Louis residents, I'm in favor of St. Louis having control of it's own police force, at least if provisions are included that ensure that the city can't raid police officers' pensions. Why should our police, unlike pretty much any other group in the country, be accountable only to a state board that might not care about the city of St. Louis and might not be familiar with it even if they do care? (I'm not saying this is true of the current board: only that the potential exists) So, in my mind, local control makes a lot of sense. However, I do want to raise a few red flags about the coalition that has been organizing around this issue. Jamilah Nasheed, who was once described as one of Mayor Slay's "fiercest critics," is now retweeting Slay and Jeff Rainford regularly. Maybe this is not a big deal. As they always say about people trying to get things done in politics: "no permanent friends and no permanent enemies: only permanent interests"
But slightly more suspicious is the support of the effort from Rex Sinquefield and the Missouri GOP. Rex, of course, is behind the earnings tax repeal that would gut St. Louis City government, and behind efforts to eliminate income tax in favor of increases in sales taxes, which would gut state government and place a much larger burden on the poor and working class while allowing Rex's fellow millionaires to continue to stockpile money. There are different ways of viewing Sinquefield. One might think that he views the Missouri political system as one of his chess matches, and he cynically uses his money to move politicians around like pawns. In this case, I think we'd want to be very suspicious of this new collaboration, and ask what exactly he's getting in return. On the other hand, you might look at Rex and think that he really is a True Believer in his right-wing anti-government ideology, and is more misguided than cynically trying to manipulate things. In this case, you might think that he just donated $300,000 to the local control cause because it fits with his ideals about government, and he's not necessarily expecting anything in return. But even if you think that Uncle Rex might be willing to do some good for St. Louis without asking for some pints of blood in return, you couldn't possibly think the same about our current GOP controlled legislature. They are led by birthers, conspiracy theorists, and people with extreme hatred of anything to the left of Sarah Palin. The Republican house already voted in favor of local control; why would they do this unless they expected something in return? What might be the exchange? I have no idea, but there are certainly extremely important issues up for discussion and Republicans are only a few votes away from a veto-proof majority. Is local control important? Yes. Is it more important that stopping the sales tax? No way. Is it more important than stopping Republicans from destroying our unions by making Missouri a right-to-work-for-less state? Definitely not. Is it more important than making sure Republicans don't game the redistricting process? Nope. I don't know if this new coalition has anything to do with these issues, but it's worth keeping an eye out. 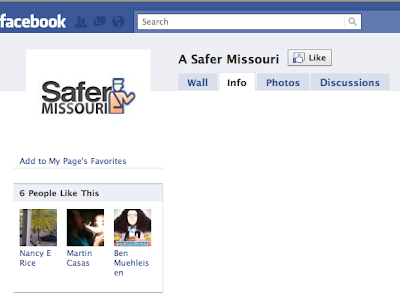 The new "grassroots" group that is funded by Rex's $300,000 is called "A Safer Missouri." Their facebook page, which has been around for a while, only had six members when I checked. Two of those members were local Democrats Martin Casas (of the Young Democrats of St. Louis) and Nancy Rice. Ben Muehleisen has worked with Sinquefield's groups in the past. Both Casas and Rice, along with Rainford and Slay, are big supporters of the move to charter schools and away from public schools, one of the issues Sinquefield is best known for. My guess is that this collaboration might have something to do with future cooperation on pushing for the charter school movement, arguably at the expense of public education. I don't want to sound all "the sky is falling!" here. 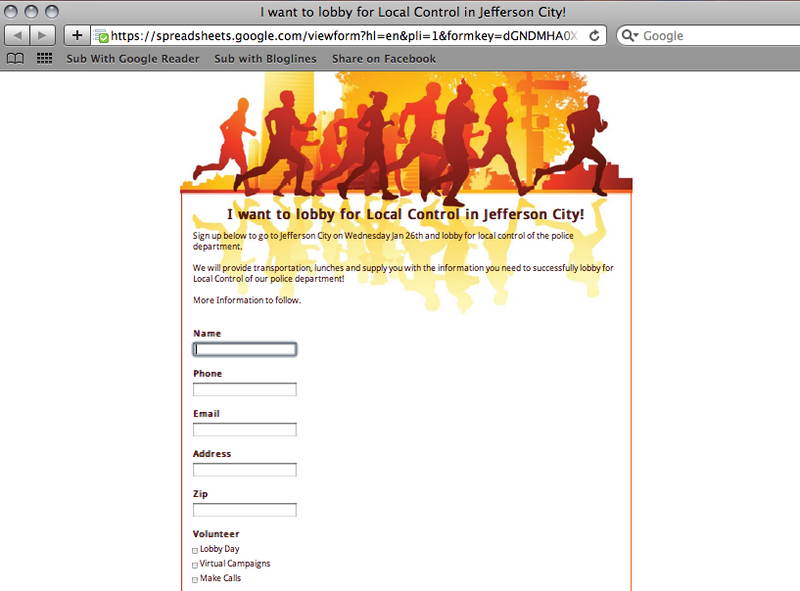 I'm in support of local control, and I don't have any evidence that Rex's support is in exchange for some blood money. However, I think it's important to raise the flag now, so that our future understanding will be informed. If there is any indication that some of the Democrats involved in this process fail to push back against Rex's right-wing agenda (like many did during the Prop A campaign), this will be useful background. Coalitions are a beautiful thing, but they are different then a circle of friends. THIs IS A HUGE ISSUE FOR THE CITY OF ST. LOUIS, and it's a civil rights issue. People frequently disagree on many issues, but when there is a common goal we have to come together and fight for it. This is the kind of thing we ask our representatives to do: to put the welfare of the people ahead of any of their personal feelings. Adam, thanks for giving me the opportunity to talk about this. I can understand why Martin supports this. But what still puzzles me is why Sinquefield, the MO GOP, and even Carl Bearden (formerly of Koch brothers funded Americans for Prosperity) would support this. I'd really like to know what they're trying to get from this. After I pointed out that Jim Durbin's shameless attack on St. Louis Board of Aldermen President Lewis Reed was based on absurd reasoning from a white supremacist blog, Durbin has announced that he has removed the link to the blog post, affiliated with the Council of Conservative Citizens blog. I'm glad he did this. However, it's important to point out that Durbin didn't just link to a white supremacist blog: he endorsed the reasoning behind the twisted attack on Reed from that blog. Durbin wrote that Lewis Reed "used race to divide the electorate," and his evidence for that claim was that Lewis Reed had sent out fliers about crime without indicating that he was black. This leaves two explanations for Durbin's behavior: either he actually agrees with that racist way of thinking, or he's so sloppy that he doesn't even bother to read blog posts before using them to attack people he doesn't like. Either way, it's not good, and he certainly still owes Lewis Reed an apology. Government to Punish Job Candidates Who've Shared WikiLeaks Info? Students seeking jobs with the federal government may be at a disadvantage if they’ve used social media sites to comment on or post links to classified State Department documents released by WikiLeaks, according to emails sent out last month by several schools’ career service offices. Related: See Gloria Shur Bilchik's post on Ballpark Village at Occasional Planet. Tea Party Links to White Separatist Blog to Claim That Lewis Reed is "Using Race"
No, I'm not making this up. The St. Louis Tea Party today promoted a blog post claiming that Lewis Reed, President of the St. Louis Board of Aldermen, was "striking out" at the tea party to "hide his corruption." One thing is for sure. The use of race to divide an electorate is in your bag of tricks. But this time, we're watching. And recording. Curious to see what Durbin was talking about, I followed the link. 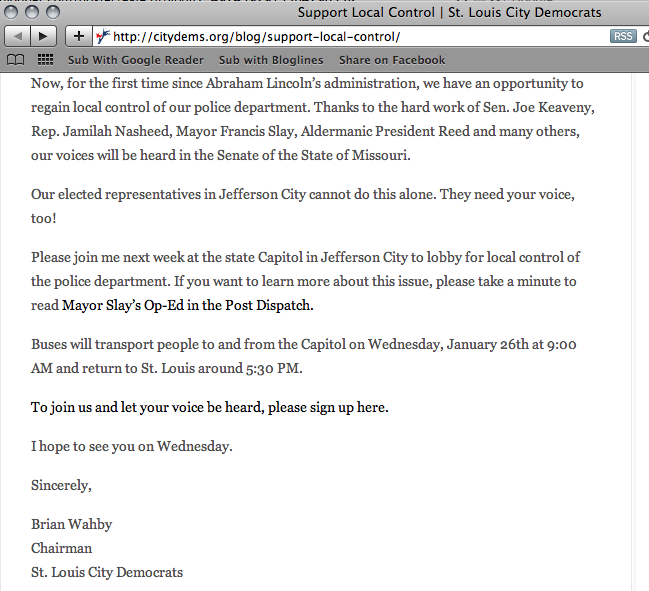 It took me to a web page proudly proclaiming a "St. Louis CofCC Blog Exclusive." The St. Louis-based Council of Conservative Citizens traces its roots directly to the racist, anti-integrationist White Citizens' Councils of the 1950s and 1960s. Its current leader, attorney Gordon Lee Baum, was an organizer for the WCC and built the Council of Conservative Citizens in part from the old group's mailing lists. Like its predecessor, the CCC inflames fears and resentments, particularly among Southern whites, with regard to black-on-white crime, nonwhite immigration, attacks on the Confederate flag and other issues related to "traditional" Southern culture. Although the group claims not to be racist, its leaders traffic with other white supremacist groups and its publications, Web sites and meetings all promote the purportedly innate superiority of whites. The ideology of The Citizens Informer's editors is echoed in the publication's pages, although in a somewhat muted form. Many articles consist of either tributes to the superiority of the white race or diatribes about black violence or Hispanic immigration. As Robert Patterson, the publication's past editor, has written in a column, "...any effort to destroy the race by a mixture of black blood is an effort to destroy Western civilization itself." Columnist H. Millard has offered a similar observation and a morek visceral anxiety about intermarriage when he argued that minorities are turning the United States population into a "slimy brown mass of glop." Other essays in the publication lament the victimization of whites at the hands of minorities and the liberal "elite." Both the ADL and SPLC sites have much more about the history full of disgusting details, so click through if you want to get the full flavor of the group. Linking to a white supremacist web site to justify the claim that Lewis Reed "uses race to divide an electorate," is extremely bad, but maybe you could argue that Jim Durbin had his head in the sand for most of his adult life and didn't realize who the group was. In fact, there is a quite a bit of evidence that Durbin has his head in the sand most of the time. However, that would not explain how he could feel free to justify his statement about Reed with the absurd logic spouted in the Council of Conservative Citizens blog post. Mr. Reed has degrees in Mathematics and Computer Science, and no doubt his math education has taught him that if he expects to win this election, he is going to have to get enough white votes from south city. While south city is becoming more and more non-white (especially black), still the vast majority of voters in south city are white. However, Mr. Reed has some competition for that white vote, and that being the white incumbent he is challenging. After seeing all that, a white voter in south city might be tempted to want to get rid of Shrewsbury now, and vote for that other guy. Except if you look way at the bottom of the yellow, underneath the red stripe. If you can’t see it, then go to the full resolution version and scroll to the bottom. Okay. Is Lewis Reed Thomas Shepard running for City Treasurer? If you didn’t know that Mr. Reed was the opposition on March 6, you would think so. But if you know, you also know that, by accident or design, no punctuation mark exists between “Reed” and “Thomas” to indicate that Lewis Reed was running for Aldermanic President, and that Thomas Shepard was his campaign treasurer. Lewis Reed needs white south city votes. But he can’t get those in the numbers he needs if the average white person knows he is black. So his strategy here is to whoop up hostility toward Shrewsbury among whites on a white concern, (black) crime, and get people not to vote for Shrewsbury or to vote for his opponent, and not indicate who is opponent is, and certainly not show a picture of his opponent. In other words, trick the dummies. Got that? This blogger is complaining about the fact that Lewis Reed, a black man, sent out an attack ad focused on crime without indicating that he is black. In fact, the blogger claimed that Reed was "tricking" voters by not including a picture of himself! He is, in effect, claiming that whenever black politicians send out a mailer about crime, they are obligated to inform the recipients that they are black! Blatant racist garbage! And Durbin links to this to claim that Reed "uses race to divide an electorate." The evidence? That Lewis Reed did not tell people he was black when he sent out a flier about crime. This is beyond despicable, and is a new low even for Durbin. Back in 2007, Bill Hennessy apologized for linking to the Council of Conservative Citizens web site. Let's hope the tea party does so again. But this is more than just a bad link: Durbin was suggesting that Lewis Reed needs to include photos of himself in mailers about crime. Without some really good explanation that I currently can't imagine, I'm not sure how anyone could justify promoting Durbin's garbage after this. Gateway Pundit: Michelle Obama's Call For People to Walk to Work is MURDER! An ordinary right-wing extremist might decide to dial it back a little the week after being caught making ridiculous claims based on obviously fake facebook profiles and shamelessly lying about petty things about the memorial service in Tuscon...multiple times. But Jim Hoft, aka, Gateway Pundit, is no ordinary right-wing extremist. More people walking of course does increase the probability of walking-related accidents. But less people driving decreases the probability of automobile accidents. And more people being in shape obviously decreases health risks. This being Gateway Pundit, however, these obvious facts are not even considered. CWA members were flabbergasted and outraged to learn that Governor Nixon proposed additional massive cuts to Missouri’s most vulnerable citizens in his state of the state address and initial budget proposal. force families with troubled youth to travel hundreds of miles to access state mandated treatment services. Governor Nixon is refusing to advocate for any measures that would significantly increase state revenue, even measures with support from both parties such as taxing internet retail sales or increasing the tobacco tax. Governor Nixon seems to have forgotten his promises to restore social services during his election campaign, but the hundreds of union members who devoted thousands of hours to his first election campaign have not. By issuing this budget recommendation, Governor Nixon has decided that the entire burden for Missouri’s economic crisis should be carried by abused children, people with disabilities, and unemployed and low-wage workers. He has decided that the interests of out of state corporations and the tobacco industry are more important than the needs of the citizens of his state who are struggling the most during this economic crisis. The 6,500 public workers represented by CWA will not forget this outrageous decision and will fight this cruel and shortsighted budget at every possible level. You can say Nixon's in a tough spot, but at the very least this calls into question his claim that he will "fight every day for every job." 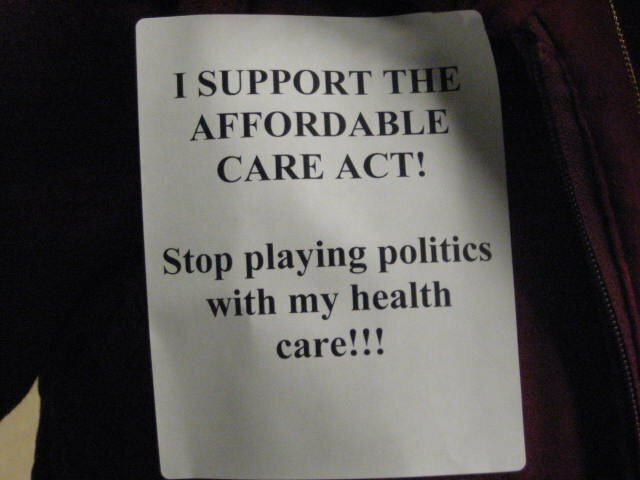 Missourians to GOP Senate: "Quit playing politics with our health care!" 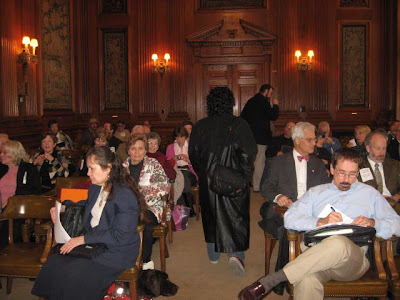 "In a stunning show of passionate activism in support of the Affordable Care Act Tuesday, over 60 voters from across Missouri and numerous organizations, packed a Senate hearing room to express opposition to SR 27, a senate bill calling on Attorney General Koster to join a ridiculous lawsuit opposing the health care reform bill passed last year. Over 20 testimonies opposed. 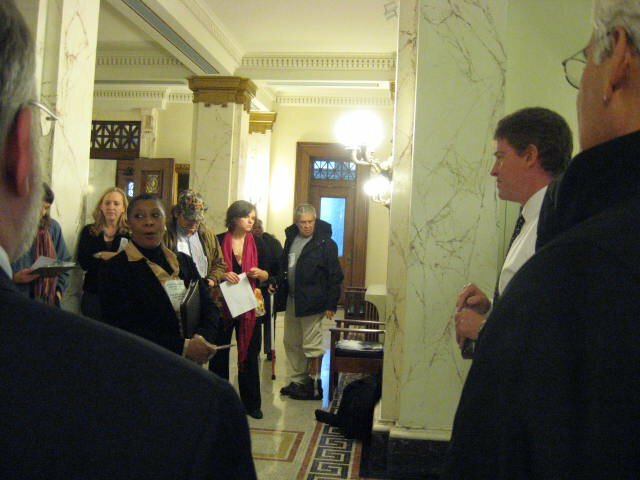 Only 1 in favor, Sen. Jane Cunningham, sponsor." "60 citizens of the state walked to the Supreme Court Bldg. in Jefferson City and requested an unplanned meeting with Attorney General Koster. He met with us for several minutes and we presented him with paper copies of 20 testimonies given before the Senate Rules Committee today in opposition to SR27." 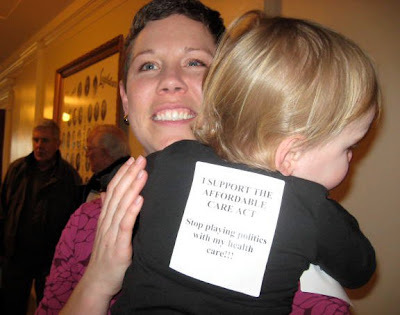 "Katie and her beautiful daughter, who also supports the Affordable Care Act." Over 60 voters and many community groups supporting the Affordable Care Act came to the Missouri Senate today to tell legislators to stop playing politics with health care. The Senate Rules Committee had a hearing at 2:30 PM in the Senate Lounge about a Resolution calling upon Attorney General Koster to sue the federal government over the health reform law. 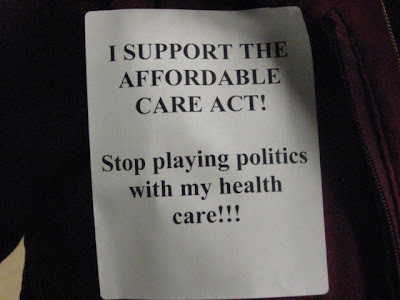 Most of those who testified stressed the benefits of the Affordable Care Act. Bernadette Gronborg of Festus spoke about the new rules that require health insurance companies to spend 80-85% of premiums on medical care. “This will make sure that we consumers get real value and real coverage for our health insurance dollars.” Gronborg said. Gronborg, who is 63, went on to say that her own health insurance premiums went up two times this year, even though she is healthy and has filed no claims. More than 16 community groups, senior groups, clergy and faith-based organizations came to tell the Senators they support the new health care law. Supporters of the federal health care law also made hundreds of phone calls and emails to Missouri Senators. From Springfield to St. Louis, Kansas City to Kennett, voters called with their personal stories about why health care reform is needed now. Those attending include clergy leaders, members of Missouri Health Care for All, Jobs with Justice, Metropolitan Congregations United, Women's Voices Raised for Social Justice, and the AFL-CIO. Thanks for the RFT Nomination!